Through the cooperative effort of private landowners, the U. S. Forest Service and the SCDNR, Wildlife Management Areas (WMAs) are provided for the enjoyment of all wildlife enthusiasts. Funds generated from the sale of WMA permits enable the SCDNR to lease approximately 1.1 million acres of land for wildlife conservation and management. Heritage Preserves are properties acquired by the SCDNR for the primary purpose of protecting habitat for rare and endangered species. Some heritage preserves offer game hunting opportunities and are included in the WMA Program. All persons using WMA lands are reminded that only US Forest Service lands and those areas marked by WMA signs are open to the public. Lands not posted with these signs are the property of private individuals, and landowner permission must be obtained. General locations of the areas described below are shown on the map on Type of WMA Properties. For detailed maps showing these and other WMA lands, write WMA MAPS, SCDNR, P.O. Box 167, Columbia, SC, 29202, call 803-734-3886 or visit www.dnr.sc.gov/wma/maps.html. Reference map # from chart below. 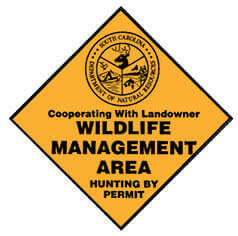 WMA properties should be marked with these yellow and black signs. Landowners providing their land for public hunting and recreation are due much appreciation from the SCDNR and all outdoor enthusiasts. Without these lands, public hunting as provided in this state would be impossible. Sportsmen seeing the yellow and black diamond-shaped signs designating WMA boundaries should remember they are hunting as guests of the landowner and be respectful of this privilege.